Heavily armed Australian police stormed a Sydney cafe early on Tuesday morning and freed a number of hostages being held there at gunpoint, in a dramatic end to a 16-hour siege in which three people including the attacker were killed. Prime Minister Tony Abbott said the gunman was well known to authorities and had a history of extremism and mental instability. During the siege at the Lindt cafe in Sydney’s central business district, hostages had been forced to display an Islamic flag, igniting fears of a jihadist attack in the heart of the country’s biggest city. Around 2 a.m. local time (10.00 a.m. ET on Monday), at least six people believed to have been held captive managed to flee after gunshots were heard coming from the cafe. Police then moved in, with heavy gunfire and blasts from stun grenades echoing from the building. “They made the call because they believed at that time if they didn’t enter there would have been many more lives lost,” said Andrew Scipione, police commissioner for the state of New South Wales. 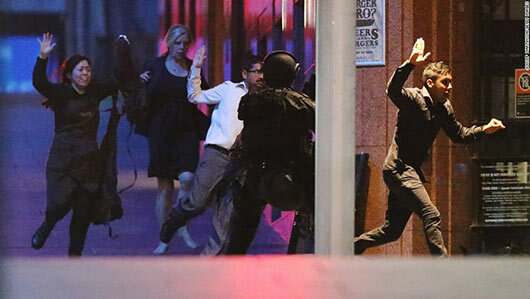 An investigation would determine whether hostages were killed by the gunman or died in cross-fire, Scipione told reporters just before dawn. Police said a 50-year-old man, believed to be the attacker, was killed. Television pictures showed he appeared to have been armed with a sawn-off shotgun. A man aged 34 and a 38-year-old woman were also killed, police said. The man was the cafe manager and the woman was a mother and barrister, local media reported. Four were wounded, including a policeman hit in the face with shotgun pellets. Medics tried to resuscitate at least one person after the raid and took away several wounded people on gurneys, said a Reuters witness at the scene. Bomb squad members moved in to search for explosives, but none were found. So far 17 hostages have been accounted for, including at least five others who were released or escaped on Monday. “To the people of Sydney, this was an isolated incident … Do not let this sort of incident bring about any loss of confidence of working or visiting our city,” said Scipione. On Tuesday morning, the area near the cafe remained cordoned off, with bystanders and passing office workers leaving flowers under police tape. Flags flew at half mast across the city. Leaders from around the world had expressed their concern over the siege, including Stephen Harper, the prime minister of Canada, which suffered an attack on its parliament by a suspected jihadist sympathizer in October. Monis was found guilty in 2012 of sending offensive and threatening letters to families of eight Australian soldiers killed in Afghanistan, as a protest against Australia’s involvement in the conflict, according to local media reports. Monis was also facing more than 40 charges of sexual assault. “He had a long history of violent crime, infatuation with extremism and mental instability,” Abbott told reporters in Canberra. The prime minister did not identify the gunman. 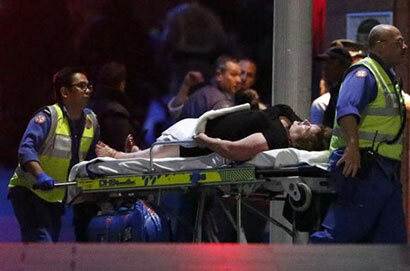 A U.S. security official said the U.S. government was being advised by Australia that there was no sign at this stage that the gunman was connected to known terrorist organizations. Although the hostage taker was known to the authorities, security experts said preventing attacks by people acting alone could be difficult. “We are entering a new phase of terrorism that is far more dangerous and more difficult to defeat than al Qaeda ever was,” ​said Cornell University law professor Jens David Ohlin, speaking in New York. News footage showed hostages in the cafe holding up a black and white flag displaying the Shahada, a testament to the faith of Muslims. The flag has been popular among Sunni Islamist militant groups such as Islamic State and al Qaeda. The incident forced the evacuation of nearby buildings and sent shockwaves around a country where many people were turning their attention to the Christmas holiday after earlier security scares. In September, anti-terrorism police said they had thwarted an imminent threat to behead a random member of the public and days later, a teenager in the city of Melbourne was shot dead after attacking two anti-terrorism officers with a knife. The siege cafe is in Martin Place, a pedestrian strip popular with workers on a lunch break, which was revealed as a potential location for the thwarted beheading. Muslim leaders urged calm. The Australian National Imams Council condemned “this criminal act unequivocally” in a joint statement with the Grand Mufti of Australia. The security operation was the biggest in Sydney since a bombing at the Hilton Hotel killed two people in 1978.